This is my first attempt at posting pics on here, so apologies if this doesn't work! I'm pretty rubbish on a computer so if these pics don't work, I'm open to suggestions! These photos have been taken with my phone so the pic quality isn't very good, something I will try and work on in the future. 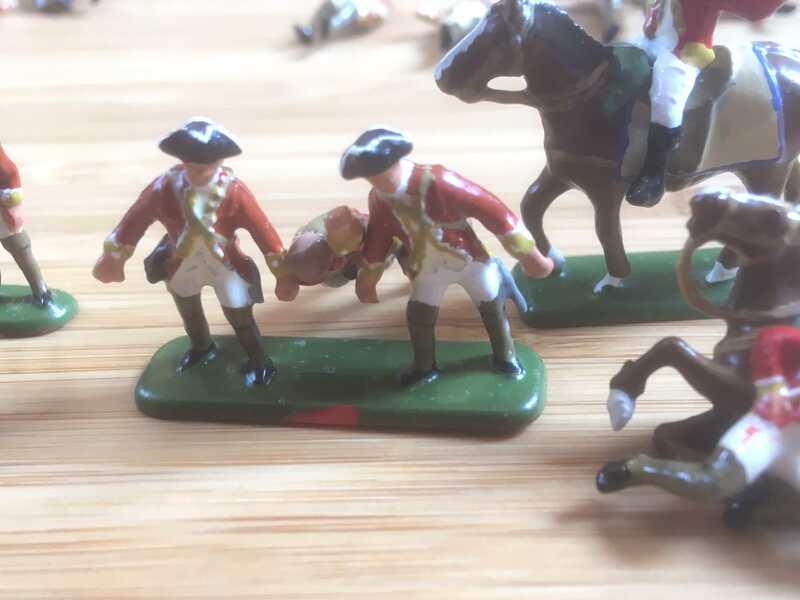 I have never made a diorama before but am going to attempt to do a couple of small ones on the British defeat at the Monongahela in 1755. This is a really interesting period of time and I would recommend David Preston's 'Braddock's Defeat' as a thorough read on the subject. A very brief overview of the event is that after several weeks of tough marching/road building through forests and mountain ranges, just a couple miles from their destination, the British forces under General Braddock were ambushed by French and Native Americans and were utterly routed, suffering huge losses, in just a few hours. Last edited by Kekso on 31 Mar 2018, 07:17, edited 1 time in total. Looks like when you get the link from postimage you don't need to put it inside the square brackets img, /img codes. it does it automatically. You've got two lots of img and /img codes there. Use the edit button to delete one of each and the links should work. I clicked on the links and it took me too postimage where I could see the pics (although in quite small format). As far as I can see your painting skills are at least a match for mine. 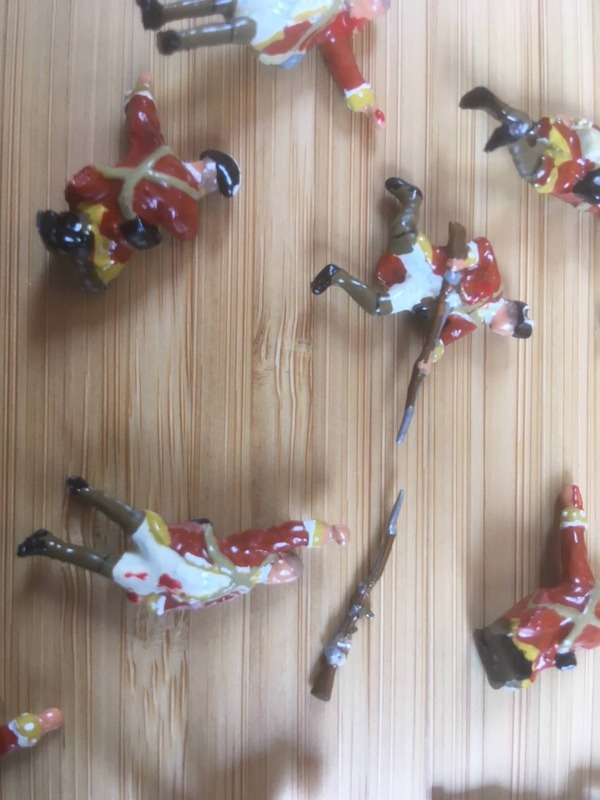 The figures look like they are neatly painted and will look good in a diorama. I look forward to seeing them posted here and maybe get a better look at them. We are always interested in pictures from all hobby friends around here. So make more pics but try to make them in a bigger scale! Hi Rich, thanks for sharing your figures. From the pictures you've posted, they look really good! Don't over-concern yourself with figure painting quality, I see this forum as a supportive place where we can indulge our hobbies in all their different ways. What's more, there will be tips and advice around which - if you're feeling so inclined - you might want to try to develop your skills further. I like the historical background that's informed your work. I'm a fan of the era that you're painting - you've chosen some of the trickiest uniforms (though best looking) to paint! As I've said - they're looking good. Larger pics would be fab and let us appreciate them even more! 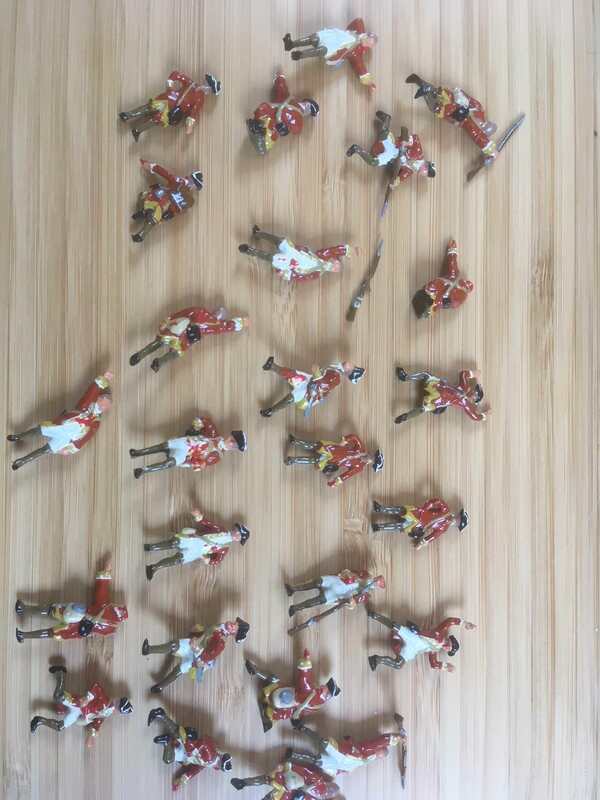 These are A Call To Arms AWI British Grenadiers as 44th Grenadier company. 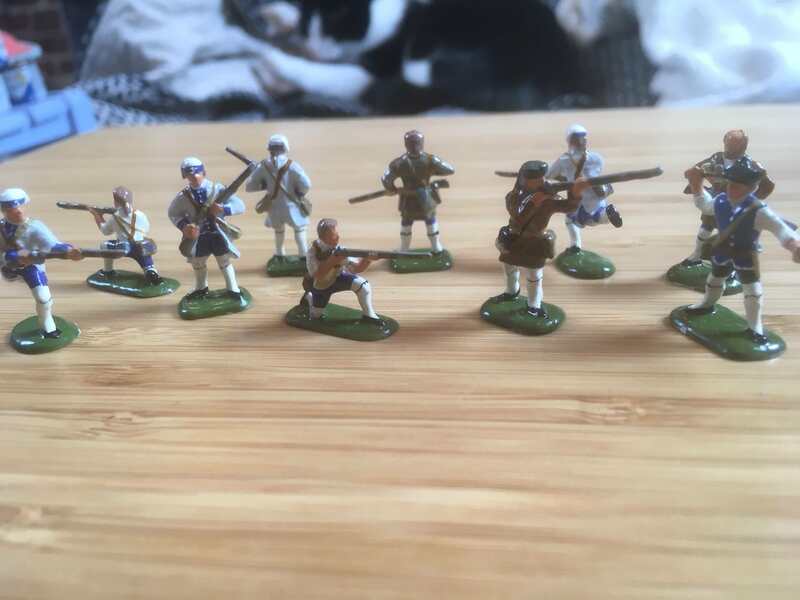 I used the mitre caps off Italeri Nap Russians as they seemed the best size match for the ACTA figures that do seem on the small side. 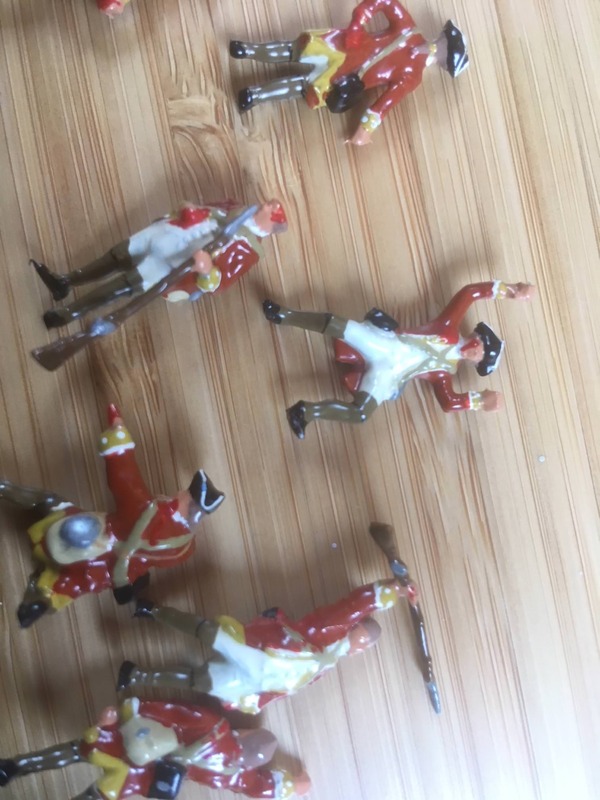 I wanted to try and use either some of the Zvezda or Hat Prussian grenadiers, but unfortunately these were just too big to go with any other sets, and were just a bit too Prussian to be turned into British. This was the first time I'd gone to the effort of converting figures and used a fiddly glue and didn't cover in the gaps between hat and head-in the future I will most certainly do this aspect neater! There is a size option on postimage Rich. It looks like you're posting the thumbnails. These are Red Box Infantry as the 44th again. Was really pleasantly surprised by how good this set is. It would be very nice if Redbox could add to this range in the future. That's better - nailed it! Yes, I agree - love to see more of this era by Redbox. 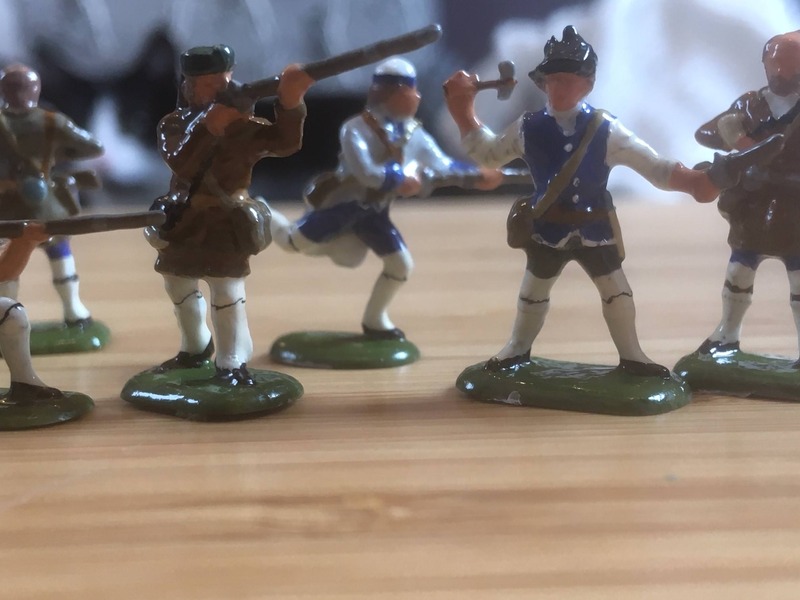 I painted about 25 of the marching infantry as the 17th Regiment for a forum Group Build last year. They're really great figures. Very good to see the figures more closely. Nice work and for me you had a unique style of painting. 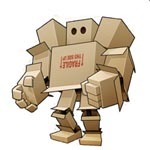 Maybe you could try to add some washings to bring out the details of the figures. I have the same impression concerning the figures. I really like these sets from RedBox. I dislike the new sets which are extremely thin. Thank you for all your comments. I see that Postimage has removed many of my photos?! If I want to add washes to my figures do I buy ready made washes or make them myself? And do you put it on all parts of the figures? I have just finished a few compagnies franches de la marine and a few Natives which I will post once they have dried. I have also done some Royal Artillery which I will post. Rich W wrote: I see that Postimage has removed many of my photos?!. postimg.ORG domain is locked by Registry, no prior notice. Please update codes embedded in your websites. 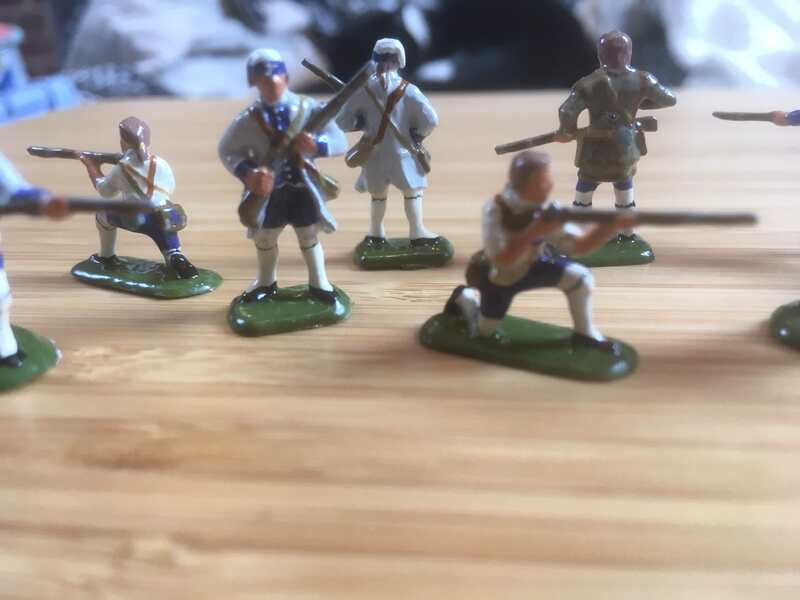 Here is my attempt at men from the Royal Artillery. 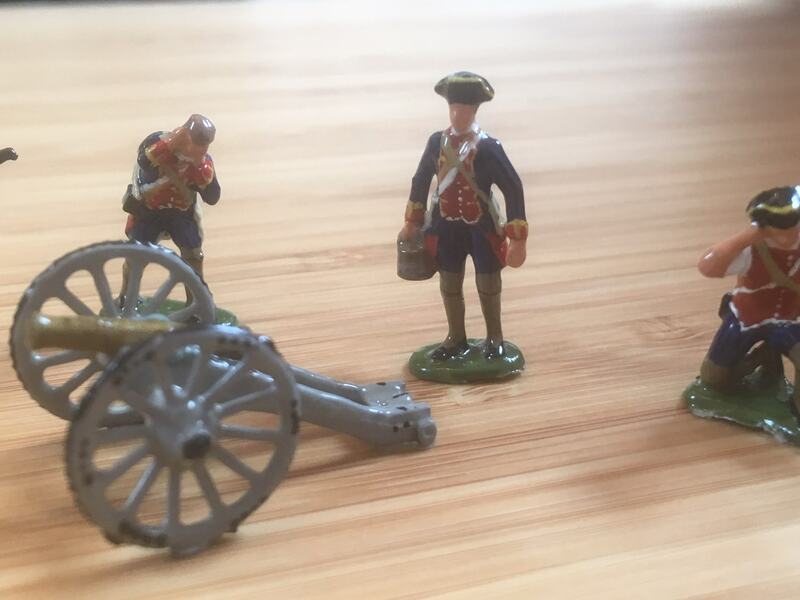 They come from the (pretty good) Imex American Artillery set. 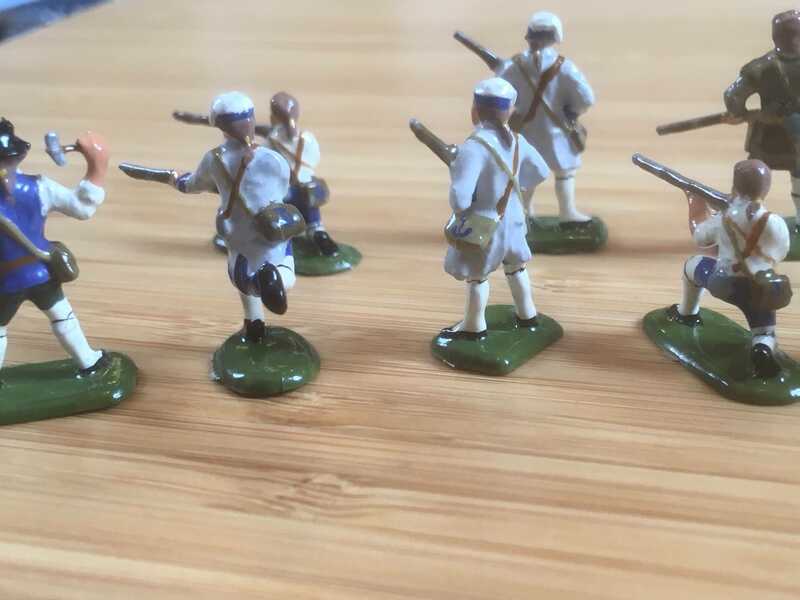 I had contradictory information on their uniforms for this campaign, so decided to go for bits from both sources and compromised...The cannon would have been a slightly smaller calibre, but I couldn't find any in my collection that would do. Apologies for the out of focus photos! Here is my attempt at creating casualties. I wasn't very adventorous with it and just looked for poses that I thought might work or that I knew I would not use for anything else. 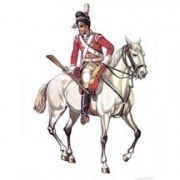 I have used the very poor Italeri American Continentals, along with a pose from Italeri British Dragoons. There are also some Accurate/Imex redcoats in there as well. Again, apologies for the bad photos! Here are some Compagnies Franches de la Marine. 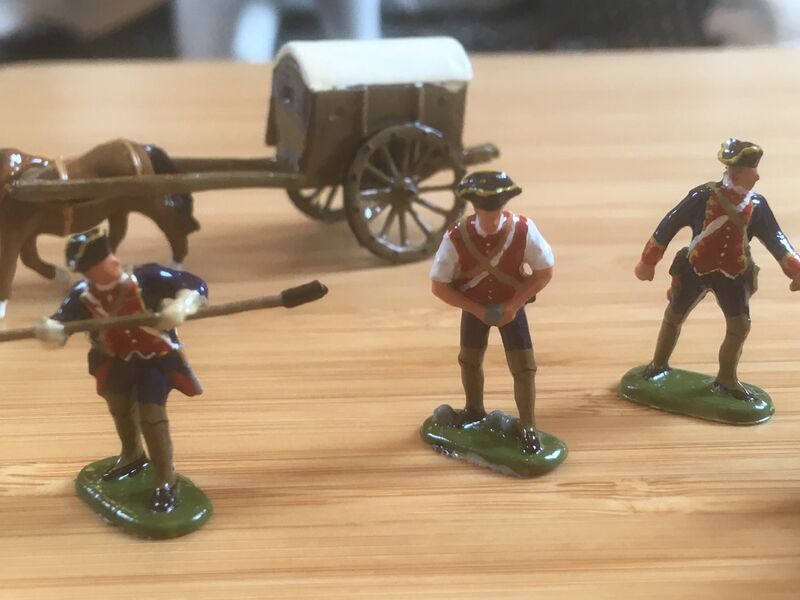 These have come from the Accurate Militia set. I plan on doing more French using a combination of Revell SYW Austrian Inf and Zvezda Northern War Russians. Traidional glossy finish. Very unique. They look like metal figures. I like the glossy finish. They really do have an "old School" metals look to them. What are you using to create it? Thank you. I'm using Ammo Mig Matt varnish. Only used it on a few sets so far and I've had mixed results. 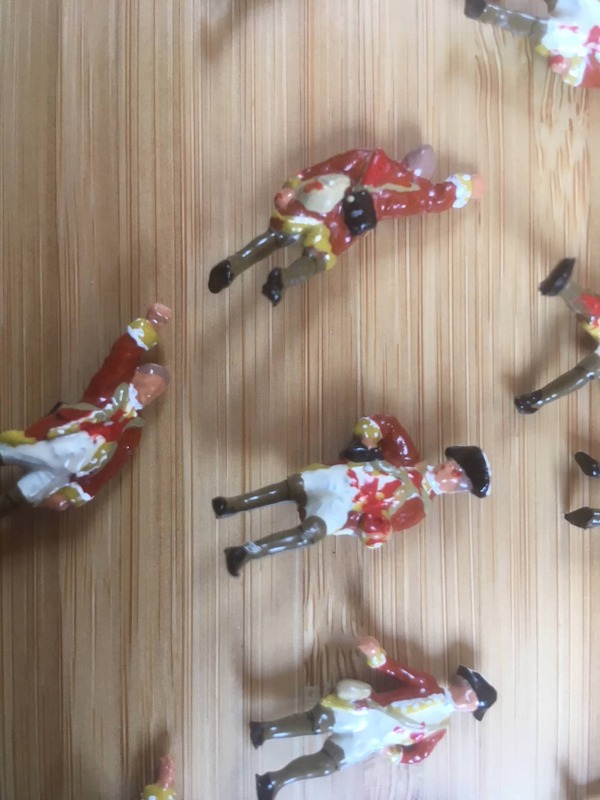 The redcoats I have done have come out in a nice 'matt' finish, however, this last batch have come out unintentionally shiny. The photos do make them look more glossy then they actually are though, a combination of bad camera phone and rarely seen sunshine! You're building up some very nice armies there, the French are very interesting. 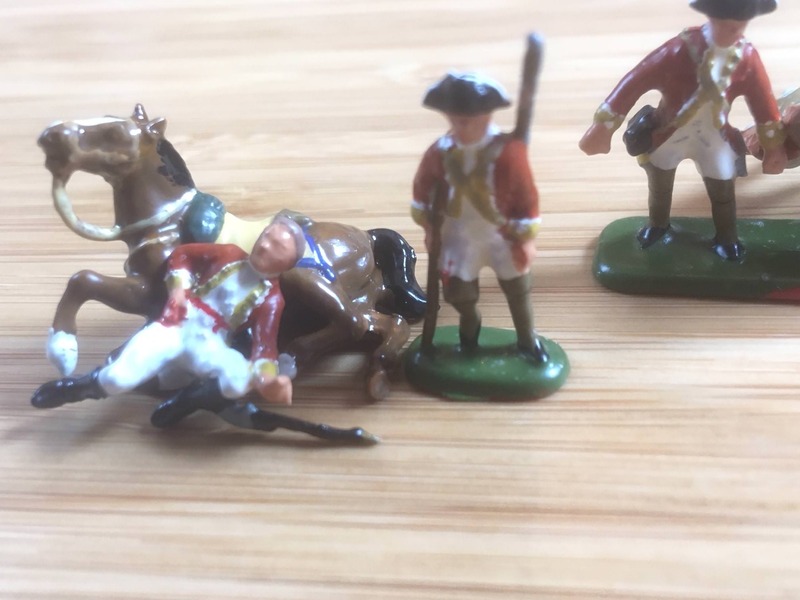 Some of those casualty figures work very well and I really like the guy leaning against the fallen horse. Looking forward to seeing more of this. Don't know if it's the same for acrylic varnish but when matt enamel turns out glossy I've found it's a mixing issue. I stir the paint for a ridiculously long time and then continue stirring for half as long again. This usually restores the matt finish. Rich W wrote: I'm using Ammo Mig Matt varnish. Only used it on a few sets so far and I've had mixed results. This might sound silly, but did you try to shake the bottle every time before applying varnish? I have matt varnish and shaking the bottle is mandatory.